The Limited Test Ban Treaty (LTBT), also known as the Partial Test Ban Treaty (PTBT), is an arms control agreement intended to restrict the testing of nuclear weapons and limit nuclear proliferation. The LTBT was initially a trilateral agreement between the United States, Soviet Union, and United Kingdom. Signed in Moscow on August 5, 1963, the original signatories sought “an end to the contamination of man’s environment by radioactive substances.” As a result, the treaty prohibits testing nuclear weapons in the atmosphere, underwater, and in outer space. It does, however, permit nuclear test explosions underground. Ratified by the United States Senate on September 24, 1963, the LTBT entered into force and opened for signature by other countries on October 10, 1963. The treaty was the result of nearly a decade’s worth of arms control negotiations between the United States and Soviet Union led by Glenn Seaborg, a Manhattan Project scientist and Chairman of the US Atomic Energy Commission (1961-1971). It reflected the two countries’ growing concerns over nuclear proliferation. The treaty came about due to mutual desire to restrain the nuclear arms race, and fears about the impact of nuclear testing on the environment and human health. In 1954, the U.S. Castle Bravo test caused the worst radiological disaster in U.S. history. Seven years later, the Soviets tested Tsar Bomba, the most powerful nuclear device in history. The Cuban Missile Crisis in October 1962 brought the United States and Soviet Union to the brink of nuclear war. The incident highlighted the necessity for greater cooperation between the two principal nuclear powers, and served as an impetus for the LTBT. The US, USSR, and UK met in Moscow on July 15, 1963 to discuss the terms of the treaty. Though they were unable to reach an agreement on a verification regime to ensure compliance, their disagreements did not stymie progress. Through direct and constructive dialogue, the three signed the treaty within less than a month. The LTBT ushered in a new era of superpower cooperation on nuclear arms control and proliferation. 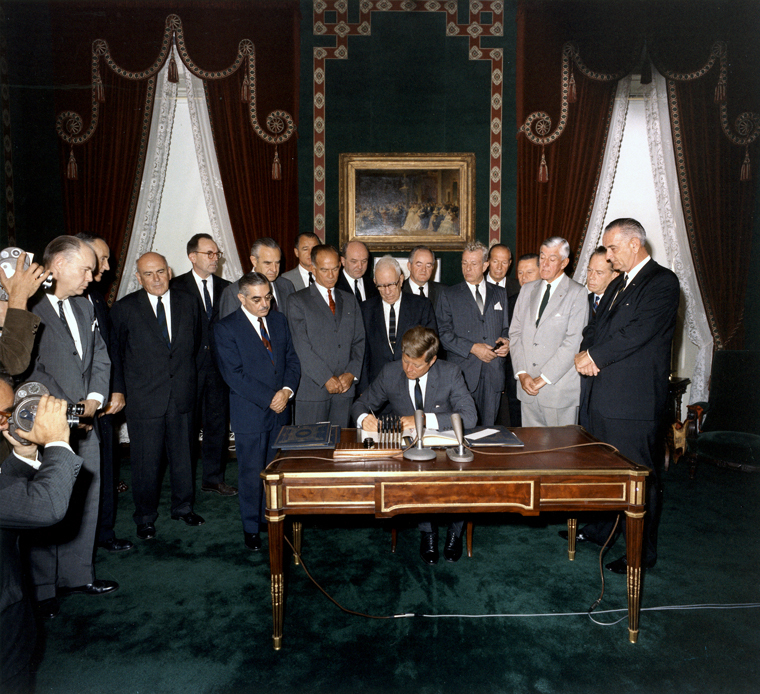 For example, the US and USSR worked with other international nuclear powers to sign the Nuclear Non-Proliferation Treaty (NPT) on July 1, 1968. Rhodes calls the LTBT and NPT the “most effective treaties in preventing rampant nuclear proliferation.” Today, more than 120 states are party to the LTBT. In 1974, the US and USSR agreed to limit the yields of underground nuclear tests per the Threshold Test Ban Treaty (TTBT). The Comprehensive Nuclear Test Ban Treaty (CTBT), signed in 1996, bans nuclear weapon test explosions. However, the CTBT has not yet entered into force as a number of countries, including the United States, have yet to ratify it. In 2017, the United Nations General Assembly approved the Treaty on the Prohibition of Nuclear Weapons. For more information on that treaty, click here.